Christmas is just round the corner and we all are busy with the preparations for the occasion. 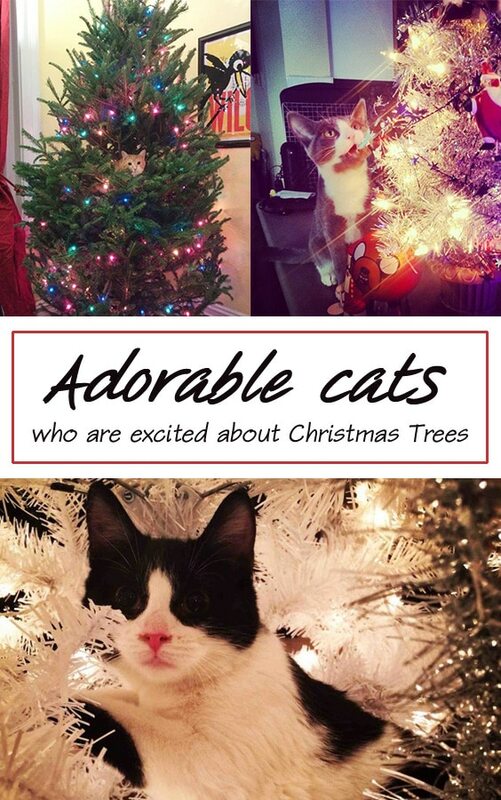 If you have cats at home, then these little adorable cats are all the more excited about Christmas and Christmas trees. 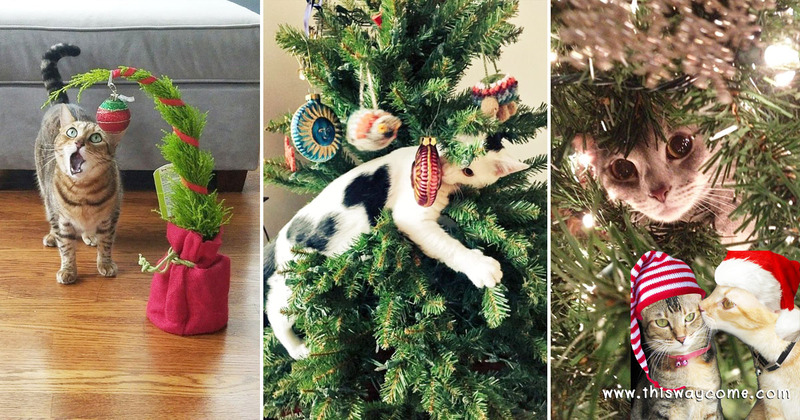 These may be Christmas trees for you, but cats think of it as a place to scale. Cats love climbing trees and high places. Christmas trees are so much an attraction for these creatures that you need to worry if you have cats and Christmas trees at home. These adorable cats love heights and just the feel of rubbing their fur against the leaves. You will find these kitties climbing on these trees and playing with the decorations and ornaments that most cat owners would find it very unnerving. The reason for this kind of behavior by adorable cats is still not very clear, but the internet is flooded with images of these Christmas cats who are the real ones enjoying the festive season to the fullest. 1. Oh..My God, it’s Christmas time again. 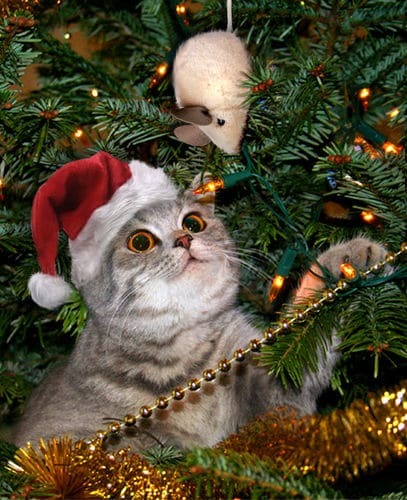 This adorable cat is thinking of how to scale this one this year and hope no one catches him. But, this time it looks pretty easy for this guy, that he is surprised. This Christmas cat couldn’t hide his feelings, he expected something big this time. 2. Wow!! What is that shiny thing on the tree? Looks pretty attractive. This kitty is planning on how to bring it down. The decoration lights are giving him ideas and he is pretty sure what to do next. 3. Look at this adorable cat and his excitement. He is very happy about Christmas and the Christmas tree. He seems to be saying “Don’t worry, I was not thinking of pulling down the decorations” when his owner came by suddenly. Can’t trust these Christmas cats and this one looks pretty naughty. 4. So many stars, I hadn’t seen so many of them together. This guy is ready to look after the Christmas tree, but his eyes convey an altogether different message. This adorable cat has already decided to scale this tree once his owner leaves the place. 5. Who said this Christmas tree is not for climbing. This little kitty loves climbing high places and this is his age too. Caught this one red handed and he is a little surprised as to how to react. Little kitty is still trying to learn his tricks; maybe this is his first Christmas. 6. This Christmas tree is the Mount Everest for this kitty and he seems to be pretty satisfied after scaling it. Probably he didn’t expect such a reception with photos being taken of the feat. His expression says, he was not expecting spectators. 7. This Christmas cat tried scaling the Christmas tree hoping to find a shiny tree mouse, but didn’t expect to be photographed by his owner. Good luck little kitty, hope you find one soon. 8. Cats and Christmas trees don’t go together and this image is the proof why it is so. This fellow climbed so up on to the tree to check if everything is fine out there. The Christmas tree seemed very wobbly and sparkly for this guy that he decided to scale it. I guess he loved the shaky climb up there. 9. Little kitty was surprised seeing his owner home. He was inspecting the ornaments on the tree and was checking if any changes need to be done. A very smart kitty with a curious nature, so much so that he is not scared to climb on the Christmas tree. 10. 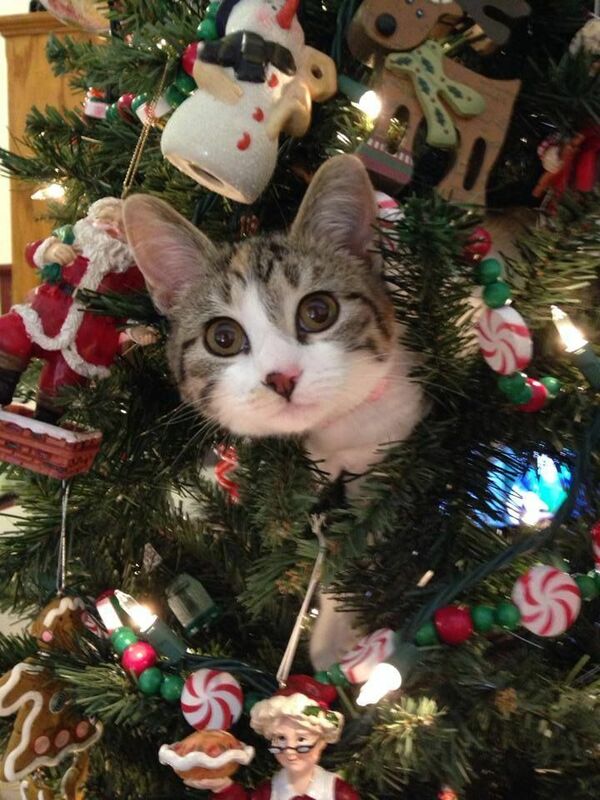 Watching over all the decorations on the Christmas tree is this adorable cat. He is still not very sure if there are any hidden presents there, so decided to explore the place again and again. A very smart chap. 11. That’s a big surprise for this cat owner. The Christmas cat is fixated on the particular decoration piece that probably looks like a birds nest. He was hoping to find a treat on this tree, but must have been pretty disappointed. 12. This smart Christmas cat wanted to hunt down the bird in the picture. The tree was placed pretty close to it, so he thought of scaling the tree to get easy access to that wall. He is masters at disguise and is not seen among all the decorations. 13. What a comfortable place to relax. This light and decorations on the tree makes this fellows fur shine and also keeps him warm in this cold winter. This kitty is happily perched on the tree and does not mind taking his pictures. 14. What an angel? No tree is small for this adorable cat. He can scale most trees and the way he is sitting on the top most part of the Christmas tree proves the point. Do you want to fix anything on top; this fella will do it for free this season. 15. This adorable cat is in no mood to come down as it feels pretty warm and peaceful out there for him. Moreover, he is safe from all the naughty kids running around the house. The safest place to be during the holiday season for him. 16. Who said this guy is stuck out there? He is happy searching for any exciting treats or birds on the tree. He knows well that birds can be found on trees and he is pretty serious about it and decided to look on. 17. Oh, you guys saw me, I was so well camouflaged. He likes this place and doesn’t want to get down. His owner will have to feed him up there this season. 18. 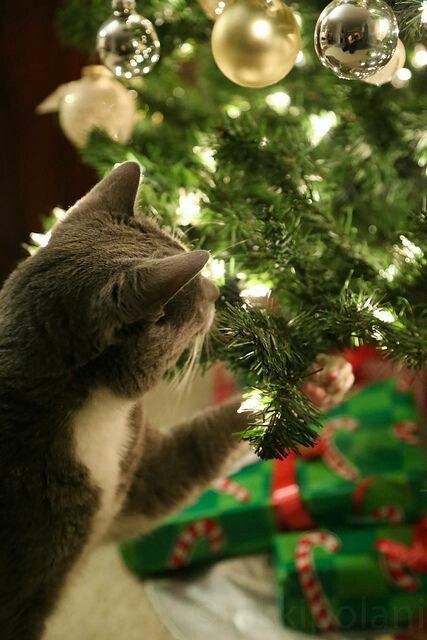 Not all cats love scaling the Christmas trees. This kitty likes to sleep under the tree on a blanket, feels like being in a garden for him. He wants you to wake him up when the Santa arrives. 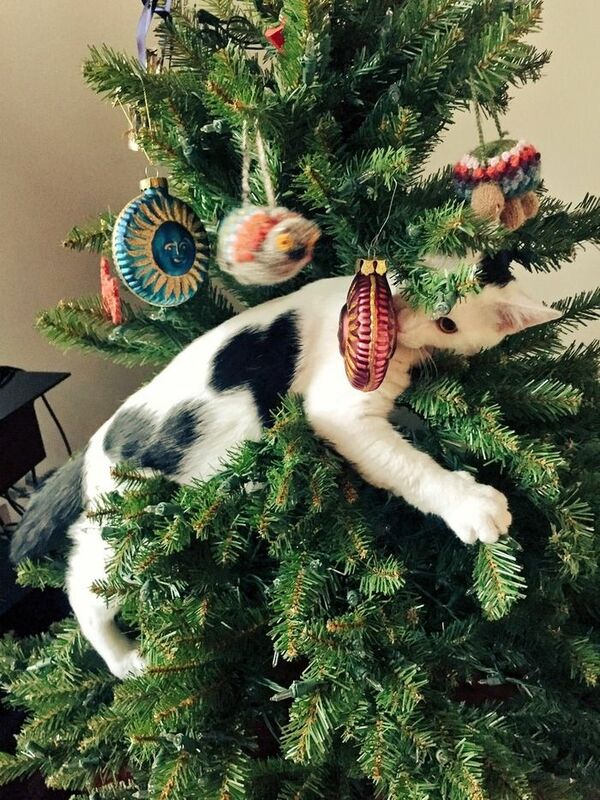 Cats and Christmas trees are a difficult combination for cat owners. If it was not for the cat owners, these adorable cats would have been unaware of the Christmas celebrations. Just like humans, these Christmas cats also enjoy these festivities and the fun surrounding it.